Kia Motors has introduced a range of design enhancements and a new engine for the new Kia Optima Sportswagon. Sold as a four-door saloon or five-door Sportswagon, the car made its debut at the 2018 Geneva International Motor Show. The Optima range benefits from a new powertrain: Kia’s all-new ‘U3’ 1.6-litre CRDi (common-rail direct injection) diesel engine. 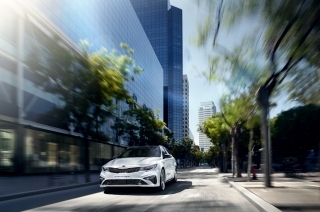 As well as refreshed exterior and interior design, the new Optima features Kia’s latest active safety and in-car connectivity technologies. Kia’s designers have made a series of modifications to the Optima Sportswagon’s exterior design. These include a revised front bumper, head- and fog lamps design. The ‘tiger-nose’ grille features a new bright chrome finish to create a more sophisticated, purposeful appearance. A new paint colour, ‘Runway Red’, is available, as well as new designs for the Optima Sportswagon’s 17- and 18-inch aluminium alloy wheels. Kia has also modified the design of the Optima ‘GT-Line S’. For added style and on-road presence, there’s new LED fog lamps, a fresh 18-inch aluminium alloy wheel design and subtle gloss black mirror caps, side sills and air intake grille. The ‘GT-Line S’ model is further distinguished by distinctive new twin exhausts. The interior features the same improvements to material quality and trim as the standard car, while the seats are finished in black leather with red stitching. Practicality was given parity with style throughout the design process. A wide tailgate and low lip make it easy to load heavy items, and a Smart Power Tailgate on the ‘GT-Line S’ and ‘GT’ models opens automatically when the smart key comes into close proximity for more than three seconds. Integrated roof rails are standard across the range. The footprint of the Saloon and Sportswagon are identical, but the Sportswagon is 5mm taller because of its sleek roof rails. 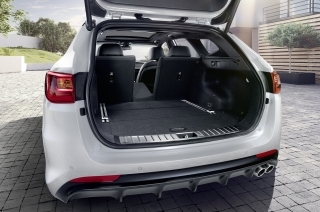 The Optima Sportswagon has 552 litres of cargo space behind the rear seats, including two underfloor storage boxes, and up to 1,686 litres with the 40:20:40 split rear seats folded. The front half of the Sportswagon, as far back as the B-pillar, is identical to the Optima saloon. From there, a rising shoulder line and more gently swept-back cabin with a raked rear window and tapering roof give the Sportswagon an elegant, sporty appearance. Depending on model, LED lamps wrap around the rear corners and there is a single exhaust outlet. The ‘GT-Line S’ and ‘GT’ versions are distinguished by ‘GT-Line’ bumpers and side sills, 18-inch alloy wheels, full LED front lamps with automatic levelling, dynamic cornering lights, a single twin chrome-tipped exhaust system on the ‘GT-Line S’ and a dual chrome tip exhaust on the ‘GT', satin chrome and body-coloured exterior door handles and black high gloss door mirrors andtrimmed side sill mouldings. The Optima Sportswagon is available with Kia’s latest Advanced Driver Assistance Systems (ADAS) creating an intelligently safe vehicle with active safety technologies to avoid or mitigate the effects of collisions. The Optima Sportswagon’s new Driver Attention Warning (DAW) system, available on grade ‘3’ and above, combats distracted or drowsy driving by monitoring a number of inputs from the vehicle and driver. It sounds a warning chime and displays a graphic in the instrument binnacle if it senses a lapse in concentration from the driver. In Europe, driver fatigue is believed to be a key factor in up to a quarter of all fatal traffic accidents across the continent. Other safety features available on the Optima include: Forward Collision-avoidance Assist (FCA) with pedestrian recognition, Lane Keeping Assist System (LKAS); High Beam Assist (HBA), and full LED headlamps with Dynamic Bending Light. Available on selected grades, these technologies make the Optima one of the safest cars in its class. The new Optima Sportswagon is available with Kia’s latest 7.0- or 8.0-inch touchscreen infotainment system, with satellite navigation and Kia Connected Services powered by TomTom®. The system offers Apple CarPlay™ and Android Auto™ to enable full smartphone integration. Android Auto™ is designed to work with Android phones running 5.0 (Lollipop) or higher; Apple CarPlay™, for iPhone 5 or newer. Within the centre console on the ‘GT-Line S’ and ‘GT’ versions there is a wireless smartphone charger, allowing users to charge their smartphones on the move. The infotainment system is linked to the Optima Sportswagon’s new higher-resolution 360-degree Around View Monitor camera system available on ‘GT-Line S’ and ‘GT’ models. The system uses cameras at the front, rear and sides of the vehicle to provide the driver with a 360-degree view of their surroundings, making it easier to complete low-speed parking manoeuvres. On grade ‘3’, ‘GT-Line S’ and ‘GT’ versions, a 490-watt Harman Kardon eight-speaker Premium Sound system is fitted as standard, with an external amplifier and sub-woofer and Clari-Fi technology to restore the sound usually lost when digital music files are heavily compressed. There are USB charging points in the front and rear in every model, while the ‘GT-Line S’ and ‘GT’ include a wireless charger for topping up the batteries of compatible smartphones. The Optima Sportswagon is now available with Kia’s all-new ‘U3’ diesel engine, designed to go beyond the stricter limits laid down by the Euro 6d Temp emissions standard. The ‘U3’ 1.6-litre CRDi (common-rail direct injection) replaces the earlier 1.7-litre CRDi engine. The engine employs Selective Catalytic Reduction (SCR) active emissions control technology to regulate emissions. The engine therefore produces lowerNOx emissions. This powertrain produces 134bhp and 320Nm of torque across a 2,000-2,250rpm engine range. 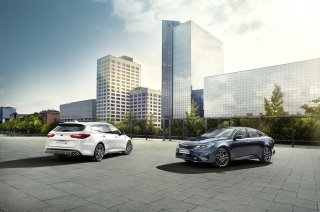 With Kia's Idle Stop & Go (ISG) engine stop/start system as standard, CO2 emissions of manual models are 121g/km, while fuel economy is a highly impressive 52.3mpg combined for grade ‘2’ and 51.4mpg on Optima ‘3’. With the 7DCT dual-clutch automatic gearbox, which is available in grades ‘3’ and ‘GT-Line S’, emissions are 122g/km, while fuel economy is 52.3mpg combined. The manual has a 0-60mph acceleration time of 10.8 seconds and a top speed of 121mph, while the 7DCT takes 11.4 seconds to complete the 0-60mph dash and features a top speed of 120mph. A new Drive Mode Selector lets Optima Sportswagon drivers switch between Eco, Comfort, Sport and Smart modes on 7DCT versions. Each mode enables the driver to customise the powertrain’s responses, prioritising fuel economy or more immediate acceleration. It also lets drivers adapt the weight of the rack-mounted power steering system, for more relaxed or more immediate, engaging steering responses. ‘Smart Mode’ is designed to anticipate the driver’s needs, switching automatically between Eco, Comfort and Sport modes depending on conditions. This enables the Optima Sportswagon to adapt to the driver’s behaviour and the road conditions, pre-empting the driver’s preference for different speeds and driving environments. Like the Saloon, the Sportswagon features Kia's rack-mounted motor-driven power assisted steering system (R-MDPS). By mounting the power steering function directly on the rack rather than the column, the engineers have been able to give the Optima Sportswagon quicker and more linear responses to driver inputs, particularly around the straight-ahead, with greater feel. The Optima Sportswagon is one of the most agile estate cars in its market segment. As an added benefit, R-MDPS gives approximately three per cent fuel savings because it draws on engine power only when the car is turning. There are four trim lines for the Optima Sportswagon ­– ‘2’, ‘3’, ‘GT-Line S’ and ‘GT’. Standard equipment matches what is available on the corresponding Saloon and is unashamedly targeted at business users who make up the vast majority of buyers in this sector of the market. There are, however, certain additions exclusive to the estate. Roof rails are standard with all three trim lines, along with a luggage area power socket, a handle for one-touch folding of the rear seats, a luggage side partition and towing connection preparation. Level ‘3’ adds the luggage rail system, boot lip trim and privacy glass in the rear doors, rear quarter lights and tailgate. ‘GT-Line S’ and ‘GT’ are further distinguished by the Smart Powered Tailgate. Grade ‘3’ upgrades the satellite navigation screen to 8.0 inches and features privacy glass for the rear windows and tailgate. There’s an eight-way power-adjustable driver's memory seat with four-way electronic lumbar adjustment, heated front seats and steering wheel. The exterior is distinguished by 18-inch alloy wheels, chrome and body colour exterior door handles, projection front fog lights and rear combination lamps and chrome-coloured side sill mouldings. The black cloth seats have faux leather sections, there are satin chrome highlights on the touch-screen bezel. Rear electric windows with an auto up/down function and an anti-trap safety feature are also found on grade ‘3’ along with a 4.3-inch premium vision instrument cluster, satin chrome interior door handles and gloss black window switch panels. The Harman Kardon Premium Sound system with eight speakers and 490W external amplifier is also standard, while the 7DCT version has paddle shifters for manual control and a Drive Mode Select function. Additional driver aids on grade ‘3’ include Driver Attention Warning (DAW), Lane Keep Assist System (LKAS) and a speed limit information function (SLIF). ‘GT-Line S’ and ‘GT’ supplement this with a wireless mobile phone charger, 360-degree Around View Monitor, the Smart Park Assist System (SPAS), Blind Spot Detection (BSD) with Rear Cross Traffic Alert (RCTA), Adaptive Smart Cruise Control (ASCC), High Beam Assist (HBA), Forward Collison Avoidance Assist (FCA) and a Smart Powered Tailgate. It has a tilting and sliding panoramic sunroof, LED headlights with automatic levelling, dynamic cornering lights, LED front fog lights and LED rear combination lights with black bezel. The upholstery is finished in black leather with red stitching, and there’s ventilated front seats and heated outer rear seats, rear door window blinds, aluminium pedals, aluminium door scuff plates, a smart key with illuminated start/stop button, LED front map lights and rear reading lights and ambient interior lighting. A leather D-shaped steering wheel with red stitching and a rear bumper with diffuser and twin exhaust completes the sporty touches. Servicing is required every 20,000 miles or once a year, whichever comes soonest. In keeping with every Kia, the Optima Sportswagon comes with the company’s unique-in-the-UK seven-year or 100,000-mile warranty, subject to certain wear and tear conditions. The warranty is fully transferable should the car be sold before the time or mileage limits have been reached, and if the car is less than 18 months old or has fewer than 18,000 miles on the clock, it is topped up to match that of a new model. ‘GT-Line S’ and ‘GT’ variants feature new LED fog lamps, new 18-inch alloy wheels, twin exhaust tailpipes and gloss black mirror caps, side sills and air intake grille. Kia’s designers have made a series of modifications to the Optima Sportswagon’s exterior design. These include a revised front bumper design, as well as new LED tail-lamps and a revised design for the head- and fog lamps. The ‘tiger-nose’ grille features a new bright chrome finish to create a more sophisticated, purposeful appearance. A new paint colour, ‘Runway Red’, is available, as well as new designs for the Optima’s 17- and 18-inch aluminium alloy wheels. Inside, the cabin features a newly-designed steering wheel and satin-chrome trim on the centre console which extends across the dashboard. Interiors include black cloth, black cloth with faux leather upholstery, black leather with red stitching (‘GT-Line S’ models) and red leather with black bolsters and red stitching (‘GT’ models). In addition, the Optima Sportswagon features new ambient lighting around the dashboard and doors, letting occupants switch between six different colours – or assign different colours to individual driving modes. By default, cabin lighting floods the cabin in a soft green glow in Eco mode, while Sport mode turns lighting to red. Smart mode fills the interior with soft blue ambient lighting. Kia has also modified the design of the Optima Sportswagon ‘GT-Line S’ and high-performance Optima Sportswagon GT. For added style and on-road presence, GT and ‘GT-Line S’ models feature new LED fog lamps, 18-inch aluminium alloy wheel designs, and subtle gloss black mirror caps, side sills and air intake grille. ‘GT-Line S’ models are distinguished by distinctive new single twin exhausts, while the Optima GT is fitted with chrome dual exhaust tips. The SPORTSPACE concept, unveiled at the 2015 Geneva Motor Show, previewed thelook of Kia’s D-segment estate car market. The Optima Sportswagon is the SPORTSPACE in showroom clothing, with changes kept to a minimum and only made where they were needed to improve practicality, keep production and ownership costs down or satisfy legislation. The rear half of the Sportswagon is characterised by a strong, rising shoulder line and a gently sloping roofline which give the cabin its swept-back appearance and distinctive tourer body shape. The rear overhang adds visual volume, but in an elegant way thanks to the raked rear window and tapering roofline. As a result, the Sportswagon has a genuinely athletic stance in a market segment noted for conservatism. Wide tail lamps – LED with a black bezel on the ‘GT-Line S’ – wrap around the rear corners. The rear bumper of the ‘GT-Line S’ houses a diffuser section containing twin exhaust tailpipes. At the rear, the tailgate is clean and functional, but makes a strong contribution to the car’s overall appearance by emphasising its width and endowing it with a ‘planted’ appearance – a feature now part of Kia’s on-road distinctiveness. There are distinct treatments for grades ‘2’ and ‘3’ and the range-topping ‘GT-Line S’ and ‘GT’, which is distinguished by ‘GT-Line’ bumpers and side sills, 18-inch alloy wheels, full LED front lamps with automatic levelling, dynamic cornering lights, a twin chrome-tipped exhaust system built into a rear diffuser, satin chrome and body-coloured exterior door handles and silver metallic trimmed side sill mouldings. The interior is trimmed in black cloth on grade ‘2’, black cloth with faux leather on level ‘3’, black leather with red stitching on the ‘GT-Line S’ model and red leather with black bolsters and red stitching on the ‘GT’ model. A faux leather finish has been applied to the door and centre console armrests; black leather is standard on the gearlever and steering wheel; and the door switch panels, door handles and interior bezels are trimmed with either metallic paint or satin chrome, depending on model. The A-list nature of the interior is reinforced by the new levels of connectivity and technology on board. Every model has satellite navigation with European mapping accessed via a 7.0- or 8.0-inch touch-screen and linked to Kia Connected Services featuring TomTom® traffic and speed camera alerts, weather reports and local search information. Bluetooth® with music streaming, Android Auto™, Apple CarPlay™, reversing sensors and a reversing camera are also integrated, while on the ‘GT-Line S’ version, a wireless mobile phone charger and a higher resolution 360-degree Around View Monitor are standard. Every model also has a Thin Film Transistor (TFT) 3.5-inch mono or 4.3-inch colour supervision instrument cluster. The seat frames, like those in the Optima saloon, are stiff and light, reducing the levels of vibration felt by occupants. For ‘GT-Line S’ the black leather seat backrest and cushion areas are arranged into 47.5mm wide tubular sections for greater comfort, and the leg and torso bolsters are 14.4mm and 25.9mm respectively more pronounced than those in other grades. ‘GT-Line S’ seats also feature red stitching. A sporty D-shaped steering wheel and aluminium pedals are also standard on this model. Around three out of every four sales of the Optima Sportswagon will be to company fleets, where whole-life running costs for operators and benefit-in-kind taxation (BIK) for users are the most influential factors. With this in mind, Kia markets the Sportswagon with a highly efficient and refined 1.6-litre CRDi turbodiesel engine, paired to either a six-speed manual or a seven-speed (7DCT) dual-clutch automatic transmission. The Optima Sportswagon is available with Kia’s all-new ‘U3’ diesel engine. Designed to go beyond the stricter limits laid down by the latest Euro 6d Temp emissions standard, the ‘U3’ 134bhp 1.6-litre CRDi (Common-Rail Direct injection) uses Selective Catalytic Reduction (SCR) active emissions control technology to regulate emissions. The 1.6-litre diesel powerplant produces 320Nm of torque. It delivers outstanding performance for an engine of this capacity with effortless driveability. With a six-speed manual transmission, the 134bhp engine emits CO2 emissions of 121g/km (combined, WLTP, converted back to NEDC 2.0), or 122g/km with a Dual-Clutch Transmission. The engine was engineered at Kia’s European research and development centre in Germany and features high-pressure common-rail fuel injection for maximum efficiency and a variable geometry turbocharger to enhance low-speed driveability while ensuring strong top-end power. Maximum torque is available from 2,000rpm to 2,250rpm. The manual has a 0-60mph acceleration time of 10.8 seconds and a top speed of 121mph, while with the 7DCT 0-60mph takes 11.4 seconds and is endowed with a top speed of 120mph. Like the manuals, 7DCT versions feature Kia’s EcoDynamics fuel-saving, CO2-reducing ISG system as standard. The 7DCT versions also have a Drive Mode Select system featuring four options – Eco, Comfort, Sport and Smart – which alter the transmission shift timing, throttle mapping and steering wheel weighting accordingly. Steering wheel-mounted paddles allow the driver to take manual control of gearshifting at any stage. The seven-speed dual-clutch (7DCT) automatic transmission was developed in-house at Kia's Namyang research and development centre in South Korea with the aim of enhancing fuel efficiency while delivering the comfort and smoothness of a torque converter transmission in automatic mode with the sportiness of a manual when the driver chooses to take control of gearchanging via the steering wheel-mounted paddle shifters. Extensive dashboard insulation lowers the amount of engine noise able to enter the cabin by four per cent, and the all-new ‘U3’ 1.6-litre CRDi engine has undergone extensive engineering to improve acoustic refinement. Large cross-member bushings front and rear eliminate a greater proportion of road noise while reducing the vibrations transmitted through the floor and steering wheel. The Optima Sportswagon is a fully connected car, with advanced technology options to enhance comfort, convenience and safety. The touch-screen infotainment system is paired as standard with a six-speaker audio on the grade ‘2’, while ‘3’,‘GT-Line S’ and ‘GT’ versions featuring a powerful 490-watt Harman Kardon Premium Sound system with eight speakers, an external amplifier and Clari-Fi, which restores sound lost with heavily compressed digital music files. The top-of-the-range ‘GT-Line S’ and ‘GT’ come with a wireless charger for compatible mobile devices, located in the base of the centre console. Occupants are therefore able to recharge mobile phones or MP3 players without the inconvenience of wires and connectors, which frequently change when new devices are introduced. The wireless charger features foreign object detection, switches on automatically when a phone is placed upon it and displays the phone's charge status in the instrument cluster. An in-built safety system prevents overheating, while drivers and passengers are warned if they are about to leave the car with the phone still on the charging pad. All versions have Anti-Lock Brakes with Electronic Brake-force Distribution (EBD) and Brake Assist System (BAS) so that the car comes to rest in the shortest possible distance in an emergency, regardless of the pressure applied to the pedal by the driver. Electronic Stability Control (ESC) and Vehicle Stability Management (VSM) prevent the car from skidding in corners or when accelerating on surfaces with different levels of grip between left and right. And Hill-Start Assist Control (HAC) checks the car for two seconds when setting off on inclines to prevent it rolling backwards. Cruise control with a speed limiter is fitted to grades ‘2’ and ‘3’, and Advanced Smart Cruise Control Function (ASCC) is standard on the ‘GT-Line S’ and ‘GT’. Emergency Stop Signalling flashes the high-level brake light in an emergency stop to warn the drivers of following vehicles, while the Tyre Pressure Monitoring System (TPMS) ensures the driver is given advanced notice of a loss of pressure long before it could lead to sudden deflation. The ‘GT-Line S’ and ‘GT’ also have a 360-degree Around View Monitor which is a higher resolution than before. Through four strategically mounted cameras, it gives the driver a bird's-eye view of the car when manoeuvring. In addition there is a Smart Park Assist System (SPAS) which automatically steers the car into parallel or perpendicular parking slots while the driver works the accelerator and brakes. There is a reversing camera integrated into the central touchscreen and audible front and rear parking sensors in every model. The LED front lights on ‘GT-Line S’ and ‘GT’ models are supplemented with Dynamic Cornering Headlights, which sweep the road in line with steering wheel movements, plus High Beam Assist (HBA) and Blind Spot Detection (BSD). Rear Cross Traffic Alert (RCTA) warns drivers about to pull out of a perpendicular parking space into the path of a vehicle approaching from the side, while Lane Keep Assist and a Speed Limit Information Function (SLIF) are fitted on level ‘3’,‘GT-Line S’ and ‘GT’ versions. Kia's Forward Collision Avoidance Assist (FCA) fitted to the ‘GT-Line S’ and ‘GT’ models employs both short- and long-range radar systems so that it can detect vehicles and pedestrians at greater distances and higher speeds. The short-range radar operates at typical city speeds of up to 31mph. Between 19mph and 50mph the longer-range radar also comes into play to detect obstacles in the car's path and respond by automatically slowing the Sportswagon to a complete stop if necessary. The pedestrian detection function operates at up to 37mph. Blind Spot Detection (BSD) acts as an extra pair of eyes for the driver when changing lanes. Sensors monitor the sides of the car and warn the driver of vehicles approaching from the left or the right. Rear Cross Traffic Alert (RCTA) adds to this by monitoring difficult-to-see areas when the Sportswagon is reversing out of driveways or perpendicular parking bays, using the Blind Spot Detection system (BSD) to alert the driver. Both these safety features are fitted to the ‘GT-Line S’ and ‘GT’ models. Lane Keep Assist System (LKAS), which is fitted to both the ‘3’, ‘GT-Line S’ and ‘GT’ grades, warns a tired driver who may be about to stray into the path of a vehicle approaching from behind. It uses a camera placed behind the rear-view mirror to 'film' the lane ahead and passes the information on to an electronic control unit that detects the lane and markings. If the control unit recognises that the car has left its lane with no indicator activated, it issues sound and visual alerts to the driver and steers the Sportswagon back into its lane if necessary. High Beam Assist, which features on the ‘GT-Line S’ and ‘GT’ grades switches between full and dipped beam automatically when there are other vehicles in in the vicinity on unlit roads. The Sportswagon driver therefore has optimum night-time visibility at all times. Cruise control with a speed limiter is fitted to Optima ‘2’ and ‘3’, while the Adaptive Smart Cruise Control (ASCC) standard on the ‘GT-Line S’ and ‘GT’ versions automatically maintains the pre-set distance to cars ahead, braking and accelerating the Sportswagon automatically and therefore minimising the risk of nose-to-tail accidents. The Optima’s new Driver Attention Warning (DAW) system combats distracted or drowsy driving by monitoring a number of inputs from the vehicle and driver. It sounds a warning chime and displays a graphic in the instrument binnacle if it senses a lapse in concentration from the driver. In Europe, driver fatigue is believed to be a key factor in up to a quarter of all fatal traffic accidents across the continent. There are four trim lines for the Optima Sportswagon ­– ‘2’, ‘3’, ‘GT-Line S’ and ‘GT’. It is unashamedly targeted at business users who make up the vast majority of buyers in this sector of the market. There are, however, certain additions exclusive to the estate. Roof rails are standard, along with a luggage area DC power socket, a handle for one-touch folding of the rear seats, a luggage side partition and towing connection preparation. Level ‘3’ adds the luggage rail system, boot lip trim and privacy glass in the rear doors, rear quarter lights and tailgate. ‘GT-Line S’ and ‘GT’ are available in Saloon. ‘GT-Line S’ and ‘GT’ supplements all this with a wireless mobile phone charger, 360-degree Around View Monitor, the Smart Park Assist System (SPAS), Blind Spot Detection (BSD) with Rear Cross Traffic Alert (RCTA), Adaptive Smart Cruise Control (ASCC), High Beam Assist (HBA), Forward Collison Avoidance Assist (FCA) and a Smart Powered Tailgate. It has a tilting and sliding panoramic sunroof, LED headlights with automatic levelling, dynamic cornering lights, LED front fog lights and LED rear combination lights with black bezel. The upholstery is finished in black leather with red stitching, and there’s ventilated front seats and heated outer rear seats, rear door window blinds, aluminium pedals, aluminium door scuff plates, a smart key with illuminated start/stop button, LED front map lights and rear reading lights and ambient interior lighting. A leather D-shaped steering wheel with red stitching and a rear bumper with diffuser and twin exhaust completes the sporty touches. The Optima Sportswagon will primarily be a business car. As such, whole-life running costs, leasing rates and benefit-in-kind taxation (BIK) are the major concerns for operators and owners/users. That is why the Optima Sportswagon is sold with a highly efficient, powerful and refined 1.6-litre CRDi turbodiesel engine. 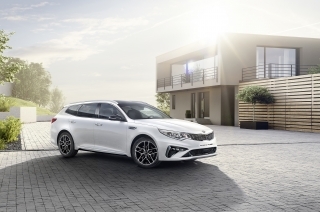 The Optima Sportswagon is ideally positioned to take advantage of business sales: both manual and 7DCT versions are CO2 efficient thanks to the standard inclusion of Kia's ISG (Intelligent Stop & Go) engine stop/start system. With CO2 emissions of 121g/km, manual versions of the Optima Sportswagon have a BIK rating of 29 per cent in 2018-19, while for the 7DCT versions with a CO2 figure of 122g/km, the rating is the same 29 per cent. Meanwhile, fuel consumption of more than 51mpg is attainable on all diesel versions, meaning that fleet running costs will be low. The Optima Sportswagon’s stylish design and high-quality finish are expected to be reflected in high residual values, which will in turn mean low monthly leasing bills for operators. The comprehensive safety features and low repair costs keep insurance rates down. And, as with any Kia, servicing requirements were factored in from the start of the design and engineering process to ensure the minimum of down time and cost when the car has to go in for routine maintenance, which is required only once a year or at 20,000-mile intervals for diesel versions and 10,000-miles for the ‘GT’ model, whichever comes soonest. Servicing is required every 20,000 miles or once a year, whichever comes soonest. The Optima is available with Kia’s ‘Kia Care’ service plans, which have been developed to provide customers with a wide range of service plan options for any Kia model within the first seven years of the vehicle’s life – matching its industry-leading seven-year warranty. A major benefit is that it is transferable to subsequent owners at no charge as long as the seven-year time limit has not been reached and the mileage is below 100,000. How significant a model is the Optima Sportswagon? A. In some European countries the Sportswagon commands 80 per cent of our D-sector sales, and overall it will take about 66 per cent of Optima sales in Europe. Three out of every four UK sales will be to fleets, and last year the Sportswagon accounted for 80 per cent of all Optima sales here in the UK. What level of sales are you forecasting in the UK? A. We never release sales or production targets for individual models; however, we expect the Sportswagon models to continue to command the lion’s share of sales. In 2017, almost 3,000 examples of the Optima Sportswagon were sold in the UK. A. We anticipate that grade ‘3’ would be the most popular, as during 2017 registration figures showed that Optima buyers chose a richer mix, with the level ‘3’ outselling all of the other versions. Grade ‘2’ was next popular, followed by ‘GT-Line S’ and ‘GT’ specification. Will the Optima’s new diesel engine be introduced to other Kia models? Does the new diesel engine require Diesel Exhaust Fluid (DEF) to meet emissions regulations? How often will buyers have to refill the Diesel Exhaust Fluid tank? 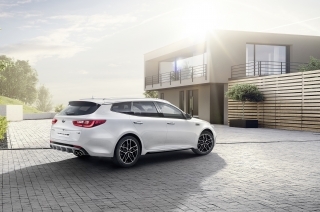 We never release sales or production targets for individual models; however, we expect the Optima Sportswagon models to outperform our internal projections. With the introduction of the latest emissions regulations, specifically the upcoming Euro 6d Temp standards, Kia diesel engines have never been cleaner. They are fitted with Selective Catalytic Reduction (SCR) active emissions control technology to regulate emissions. For higher mileage users, diesel cars make total sense, delivering low running costs and exceptional fuel economy figures. Temporary spare on ‘2’ grade. Tyre mobility kit on ‘3’,‘GT-Line S’ and ‘GT’. It seems hard to imagine today, but less than five years ago Kia had never produced a performance car in its entire history.